A synchronous motor may be started by a DC motor on a common shaft. When the motor is brought to synchronous speed, AC current is applied to the stator windings. The DC motor now acts as a DC generator and supplies DC field excitation to the rotor of the synchronous motor. The load may now be placed on the synchronous motor. Synchronous motors are more often started by means of a squirrel-cage winding embedded in the face of the rotor poles. The motor is then started as an induction motor and brought to ~95% of synchronous speed, at which time direct current is applied, and the motor begins to pull into synchronism. The torque required to pull the motor into synchronism is called the pull-in torque. As we already know, the synchronous motor rotor is locked into step with the rotating magnetic field and must continue to operate at synchronous speed for all loads. During no-load conditions, the center lines of a pole of the rotating magnetic field and the DC field pole coincide (Figure 1a). 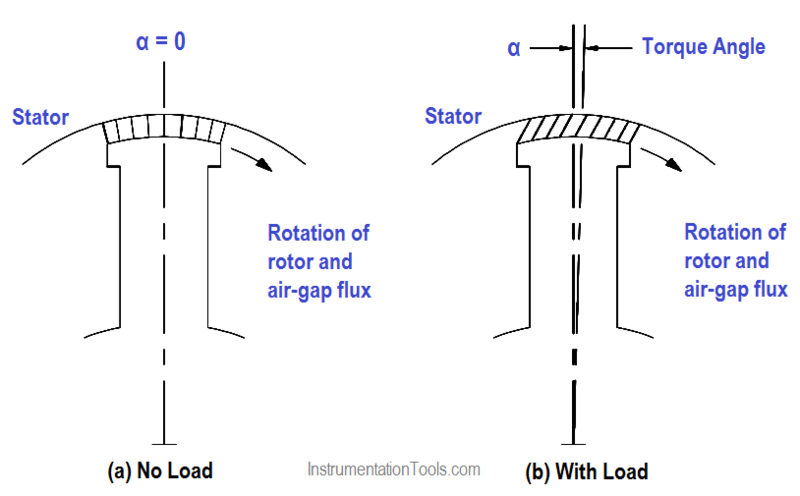 As load is applied to the motor, there is a backward shift of the rotor pole, relative to the stator pole (Figure 1b). There is no change in speed. The angle between the rotor and stator poles is called the torque angle (α). If the mechanical load on the motor is increased to the point where the rotor is pulled out of synchronism (α≅90°), the motor will stop. The maximum value of torque that a motor can develop without losing synchronism is called its pull-out torque. For a constant load, the power factor of a synchronous motor can be varied from a leading value to a lagging value by adjusting the DC field excitation (Figure 2). Field excitation can be adjusted so that PF = 1 (Figure 2a). With a constant load on the motor, when the field excitation is increased, the counter EMF (VG) increases. The result is a change in phase between stator current (I) and terminal voltage (VG), so that the motor operates at a leading power factor (Figure 2b). VP in Figure 2 is the voltage drop in the stator winding’s due to the impedance of the windings and is 90° out of phase with the stator current. 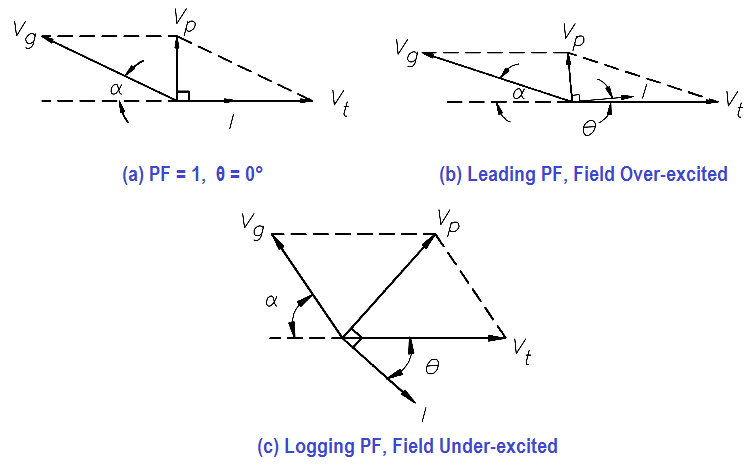 If we reduce field excitation, the motor will operate at a lagging power factor (Figure 2c). Note that torque angle, α, also varies as field excitation is adjusted to change power factor. Synchronous motors are used to accommodate large loads and to improve the power factor of transformers in large industrial complexes.